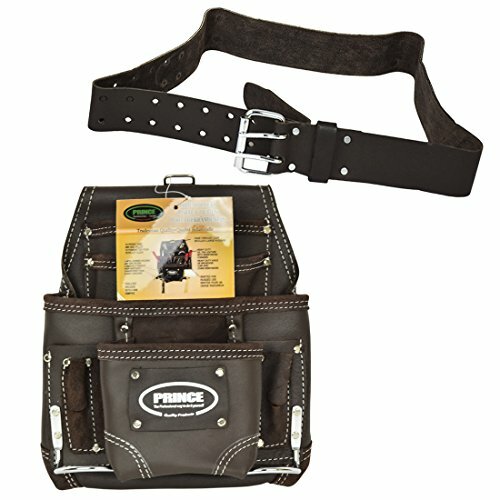 BELT: This wide 2.00" work belt is designed for maximum comfort during all day on-the-job wear. Tough top grain oil tanned leather insures long life durability while carrying and supporting multiple pouch rigs. Double prong roller buckle insures maximum support strength and cinch-up closure. Fits up to a 48" waist. POUCH: Constructed of heavy duty top grain oil-tanned leather, this premium quality large 10 pocket nail and tool pouch is ideal for Framers and Roofers. It holds most hand tools and fasteners and has 4 tiers of pockets for additional organization of tools including 6 small pockets for small tools. It is rivet reinforced on stress points for added durability. Dual steel hammer loops make this pouch flexible for either right or left handed users. Additional/other information from Seller: Features - Constructed of heavy duty oil-tanned leather for durability and rugged use, 4-tier design for easy separation of tools and fasteners. Designed for bulk storage of fasteners. Reinforced wear points for added durability. Dual metal hammer holders for left and right hand use. Features a 3.5 inch belt loop and 1 metal top ring. Turn ring down for maximum comfort during wear or turn upright to hang or store on hooks.